(NaturalNews) The world is slowly waking up to the fact that, when you give the body what it needs, it can heal things we previously thought were impossible. 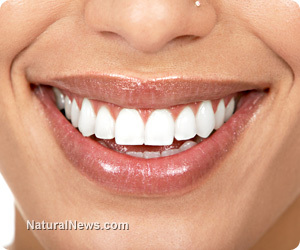 A fine example of what is often deemed as an incurable health problem is dental cavities, but extensive research is now becoming more public about the true nature of tooth decay and the fact that there are proven remedies that can remedy it. "[Tooth decay] occurs when foods containing carbohydrates (sugars and starches) such as milk, pop, raisins, cakes or candy are frequently left on the teeth. Bacteria that live in the mouth thrive on these foods, producing acids as a result. Over a period of time, these acids destroy tooth enamel, resulting in tooth decay." • Fermented cod liver oil - very high in fat soluble vitamins A, D and K.
• Magnesium - required to use calcium and phosphorous effectively. • Gelatin - if you don't have time to make bone broth, this is a good alternative and is great for gums and digestion. Derek Henry took a deadly health challenge that conventional medicine couldn't solve and self-directed a one-in-a-million health journey that found him happier and healthier than he had been in his entire life. As a result of this rewarding journey, he now spends his time writing, coaching, and educating thousands of people each month who want to enjoy similar results under their own direction. Find out how you can reverse disease and thrive with a holistic approach.